Today we will be covering some great uses of a bandana. Bandanas are a great multi use item that can lower your pack weight and simplify life. When I go on an adventure, I always bring a bandana with me. For ease of use, I have broken down what I think are some of the best uses for bandanas into five sections. A bandana can act as a backup for multiple items. The first item a bandana can replace is a leash. A make shift leash can be created if the one you have takes a turn for the worst. Plus, a bandana can be used to make an improvised collar or you can use it as a snazzy dog ascot. Finally, if you are taking a break and want a toy to play with your dog, you can use one of your bandanas for tug of war. The bandana has many uses in making improvised medical equipment. One of the most helpful uses for a bandana in an emergency in my opinion is first aid. Bandanas can make great bandages for injury you get on your adventurers; you can wrap or pack a wound. If things get really, bad bandanas can be used as a makeshift tourniquet. Also, bandanas are great for making slings/splints for broken bones. These are just a fraction of the medical uses of a bandana in an emergency. Another great use for a bandana is a bindle, which is a cloth or bandana tied around a stick to make carrying much easier. Making a bindle is an option if you lose your pack or it’s damaged and can no longer be carried. In addition, you can also tie a bandana as a smaller pouch on your belt or bag for an extra pocket to carry your goodies like freshly picked fruits and vegetables (like all those yummy prickly pear fruits). 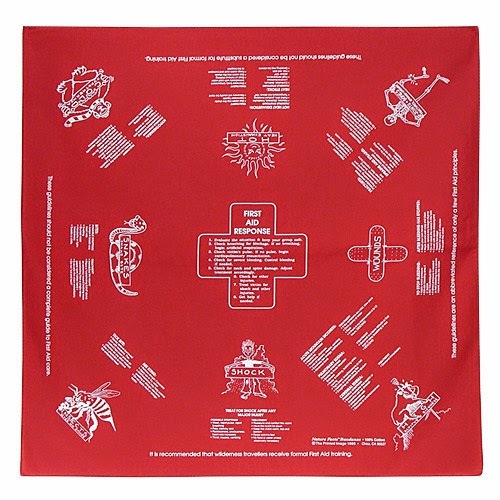 Whether you are camping, day hiking, or on any other adventure, a bandana can be used as a washcloth. Moreover, a bandana can be used as a small towel for drying off with. However, my favorite use for a bandana is using it as a headband. This keeps the sweat and rain off your face. Finally, if you are out hunting or in an emergency situation, you can cut the bandana and use it as a rag to clean your firearm to help keep it maintained. The final section for bandana use is cooking/food. You are able to use a bandana for a lot of things with your food. The most important to me is a pre-water filter to remove any sediment out of your water before boiling or filtering. 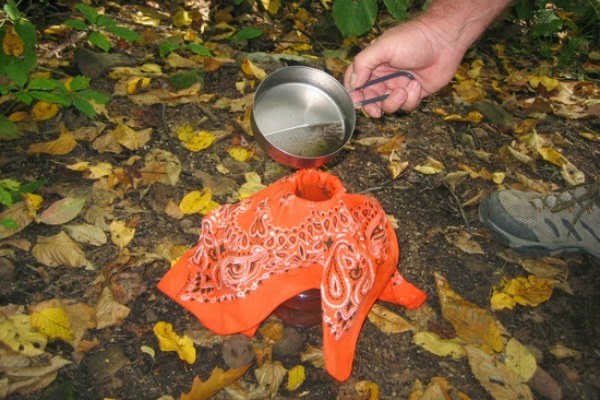 You can use the bandana as a potholder after boiling water or cooking your bacon. Finally, a bandana can be used as a rag to wipe out your pots and pans once you have finished your tasty meal. Bandanas are just a great multi use item that should have a place in everyone’s packing list. After checking out the list, I hope that you will start bringing bandanas with you on your adventurers. Because bandanas can be used as an everyday tool but also an emergency tool. If you have special things you do with your bandana lets us know. Also, if you enjoy the blog, please follow us on Facebook. I''m not really a bandana wearer so none to 1, but Jack loves some bandanas. I think he tries to pack at least 2, so he can swap them out to keep sweat out of his eyes. Normally I carry three. One on my head and two in my pack. You could also list that it is useful for wetting and wearing around your neck to help feel a little cooler on a hot day. Works better than the fancy expensive thing I bought. I have been trying to find an adventure to use one of those fancy expensive things on, but most of our adventures go down where it's really humid. Hopefully we'll do a desert voyage soon.